The Battle of Salamis was a naval battle fought by the allied Greek city-states and the Persian Empire in September 480 BC between the island of Salamis and the mainland Greece (Wikipedia Contributors). Prior to the battle, Xerxes, ruler of Persia, had won battles in Artemisium, Thermopylae, and most notably, Athens, which he captured in September 480, as a part of the Greek Conquest. However, the Greeks, stationed at Salamis, remained close to the Athenian harbor, and thus were a strategic problem for the Perisans who hoped to be able to transport supplies to their army, which was moving to the Isthmus of Corinth (Lendering). 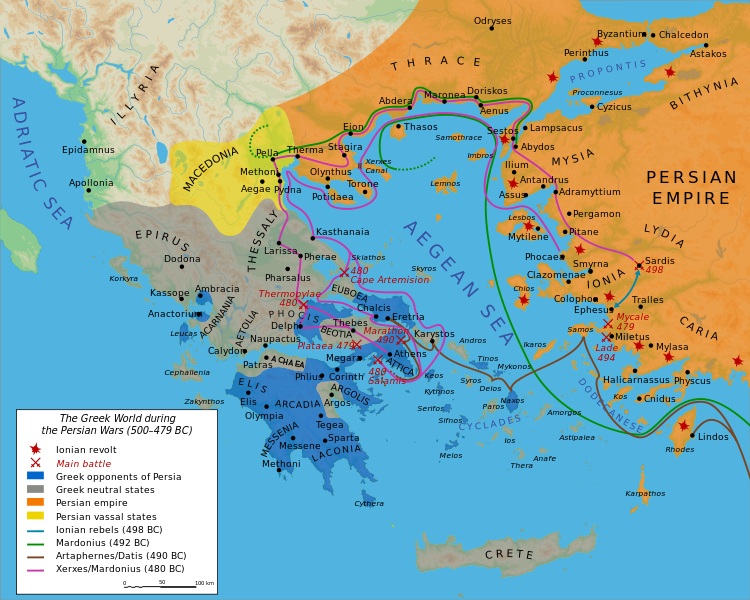 The following map, which shows the Greco-Persian wars, indicates the location of Salamis, and its proximity to Athens. Map: Bibi Saint-Pol. “Map Greco-Persian Wars.” Map. Wikipedia. Captain Blood, 27 Feb. 2007. Web. 11 Feb. 2014. Despite the successes of the Persians, the Greeks were persuaded by the Athenian general Themistocles to go battle at sea (Wikipedia Contributors). What was resulted was an overwhelming victory for the Greeks. Herodotus describes the shockwaves such news meant to the Persian people, who first heard about the victory of Athens only to be quickly informed of the devastating loss near Salamis, “the first message had arrived at Susa while Xerxes was in possession of Athens, and the news so delighted the Persians who had stayed behind that they scattered myrtle on all the roads, burned incense, and gave themselves over to sacrifices and pleasure. The second message, following closely as it did on the first, so disturbed them that everyone tore their tunics to shreds, with endless crying and wailing, and placed the blame on Mardonius” (Herodotus, 642). Following the defeat, Xerxes sought the counsel of Artemisia, who had previously given him war advice. She recommended that Xerxes abandon the campaign and leave it to be managed by Mardonius, whose reputation and honor was intertwined with the campaign. With Xerxes back in Asia, he could rule free from the failures of the campaign, should it continue to go poorly, but reap the benefits if Mardonius was successful. Xerxes followed this advice, leaving Mardonius to continue the campaign against the Greeks (Herodotus, 644). While Xerxes gave Mardonius the pick of top soldiers to stay behind, the transition period stalled their military strategy and caused them to rest at a winter quarters. This gave the Greek armies time to regroup. While Mardonius continued the conquest the following year, with an insufficient number of soldiers and an energized opponent, he was unable to maintain momentum, and the campaign ended (Lendering). The great victory at Salamis also shaped Greek thought. In his thoughts of the Battle of Salamis in regards to political theory, J. Peter Euben states that, “Salamis set the terms in which Athenians defined themselves as a people.” Additionally, J. Peter Euben went on to explain that while initially the battle was seen as the will of the Gods,, the Greeks came to view it as a product of their own collective strength. Thus, forming an understanding that “their power (as distinct from their material strength) and so their triumph, as emulating from democratic ethos” (Euben, 1986). Ultimately, the victory of the Greeks at the Battle of Salamis turned the tide of the war, delaying Persian action, and giving the Greeks time to regain strength in their numbers and stopping Persian advances. Additionally, the victory at Salamis impacted Greek consciousness, giving the Greek people a sense of “people” and value in democratic ethos. Euben, J. Peter. “The Battle of Salamis and the Origins of Political Theory.” Political Theory 14.3 (1986): 359-90. Web. Lendering, Jona. “Naval Battle of Salamis (480 BCE).” Livius.org. Livius, 17 July 2008. Web. 10 Feb. 2014. <http://www.livius.org/saa-san/salamis/battle.html>. Wikipedia contributors. “Battle of Salamis.” Wikipedia, The Free Encyclopedia. Wikipedia, The Free Encyclopedia, 11 March. 2005. Web. 10 Feb. 2014.